i m just speech less when hurd see its features. It is more faster & smater than android. AnonD-739, 29 Aug 2011Kid the N9 can use Android apps so shut up !are you sure about it ...? any way not all apps so keep it cool . Anonymous, 28 Aug 2011no apps like appleKid the N9 can use Android apps so shut up ! Beautiful phone. Nokia should make a 5inch version (Phone and a mini tablet) so I don't have to buy other tablet. I am going to buy 3 (all colours), 1 for myself, 1 for me and 1 for I. Something like me, myself and I.
does N9 realy support android apps??!? too little too late.. sorry nokia..
im sure it will be too expensive when released..
go for android.. it better in everything than this piece of publicity.. Led Backlit is missing, i think so Nokia should think vast comparing to the advanced technology, all features are ok but other than Amoled display he should think to replace with a Led Backlit & release. dudu, 28 Aug 20111 Ghz single-core, when SGS2 has already 1.2 Ghz dual-core ? I smell a big fail...don't worry buddy, we are aware of that but still I am buying n9.. you will not buy it so why worry? 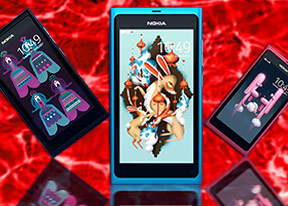 The nokia n9 is really awesme with its swipe feature but it lacks in memry slot and usb otg support.while dis all r present in n8.and frends n8 is smart with camera while n9 also smart nd also has high speed continuos video recording.also n9 has wifi with hotspot.thus overall n9 wins but without releasing and using new meego os whch nt have apps cmparable to symbian os of n8 we cnt say anything abt n9. Bt still nw n8 is better dan anything.and nw with symbian anna! So first wait till n9 nt cmng in the market. Not say anything abt n8 and n9. nokia wake up and tell me the releasing date of n9 in india and launch date of winMo7 phone ! boffin, 28 Aug 2011Useless compared to samsung s2honest... sg2 is useless compared to n9..